Written originally for Review A Bad Game Day — August 8, 2012. I unfortunately remember reading about this game in magazines and seeing it one time at a Commodore User Group while I was in school — and while it is a really bad game, I didn’t quite remember what a steaming pile of garbage this game really is. 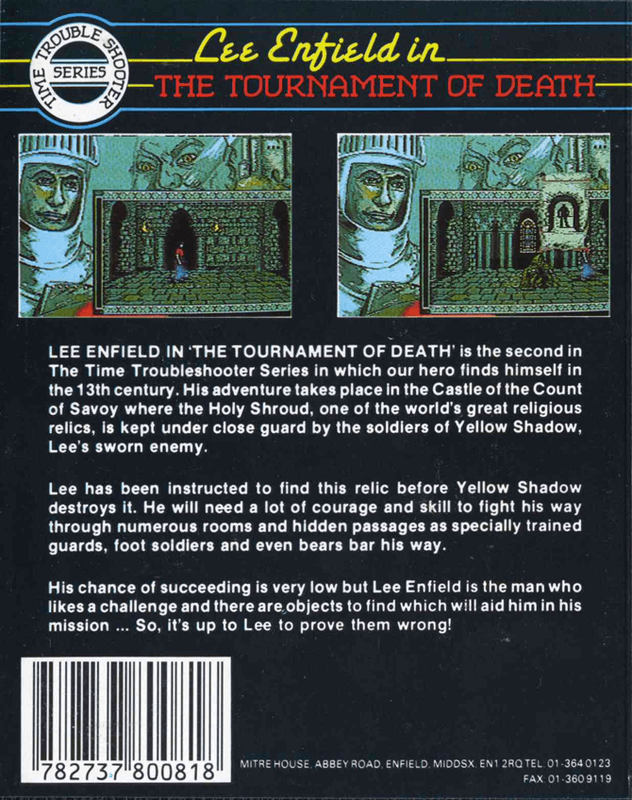 As part of the Time Trouble Shooter series, Lee Enfield finds himself in the 13th century in the Castle of the Count of Savoy. Here, the Holy Shroud — which happens to be a religious relic — is guarded by the soldiers of the Yellow Shadow — his sworn enemy. Lee must find the relic before the Shadow destroys it. The theme of the game actually sounded fine, but what is the Yellow Shadow? Knowing those facts above are more inspiring than this game, what would make you run this binary swill that should never have been released? Well, I will do it anyway so I can review this game for anyone interested in why this game stinks so much. Upon starting the game, you will see a static picture of a knight in green armor on the right side of the screen (I am assuming this is Lee) and what kind of looks like a blue vampire on the top of the screen next to the yellow italicized words “Lee Enfield”. In the bottom left of the screen is a yellow and black rectangular area taking up just slightly more than a quarter of the screen, with what appears to be two vertical health/status bars on the left and right edges. Inside the yellow and black area appears to be a character standing there with no armor and strangely, no head. What a great start to this game, instantly shattering any hope you might have had for it. When the character does eventually move, a gray colored head and arms do suddenly appear. It then strikes me that this small area is the area where all of the game play takes place and I am guessing the color scheme is maybe meant to represent the Yellow Shadow controlling this castle — but it is quite weird that the majority of the screen is taken up with what seems to be a static background for the entire duration of the game. 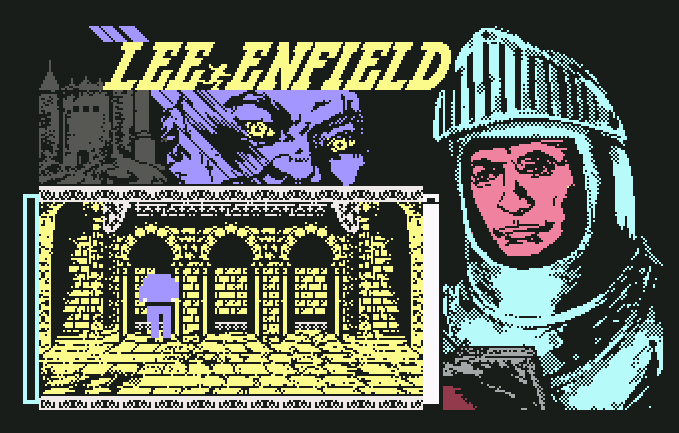 I did read that on the Atari ST version, the facial expression of the knight actually changes depending upon circumstances in the game, but I have yet to see anything remotely close to this on the C64 version. So with game play confined just to this yellow and black rectangular area, I had difficulty at times deciphering the type of enemy I was actually trying to stop and this small area made controlling your character extremely difficult at times — but I do remember something being different. The first obvious thing you notice based on the images shown on the cover is that Lee is on the left side of the screen, the game play area is on the bottom right, not yellow and black and is significantly larger! I then wondered if this was due to the Commodore 64 version being a Spectrum conversion (remember Head Over Heels) but my limited research has only uncovered versions for the Amstrad CPC and Atari ST being also made. I am therefore guessing that the images shown on the back cover are from the Atari ST version due to the resolution and colors shown. Using Atari ST and Amiga screenshots on the box covers sadly was a fairly common practice with Commodore 64 software. Something must have gone wrong with the graphics on the C64 version — particularly as all of the character sprites are small, blocky and gaudy. The background also does not seem to change much at all from this yellow and black brick appearance throughout the game which makes for a totally uninspiring experience. Let’s also inspect the text on the back cover now as well. Well, there is some truth in what is written there. The theme is as expected and it states that his chance of succeeding is very low — how ironic — because the controls are that unresponsive and to maneuver close enough to objects you are meant to collect is near impossible. The combat is a totally unsatisfying joystick waggling experience and quickly becomes tedious. When you lose all of your health status bar, you seem to be teleported inside some space-time bubble that rolls off the screen and then you begin the entire experience all over again — how wonderful. With the screen presentation and graphics terrible overall — and with game play that is unforgiving and difficult, this games only savior can be its sound. Well, I guess as expected, the sound is hideously atonal. The soundtrack just infinitely loops every 1 minute 42 seconds, and you will hear it over and over if you are insane enough to have this game running for longer. The unmelodious nature of the sound only makes it suitable as a ringtone or an alarm sound, as this would wake even the most comatosed sleeper. Given that, it’s probably the best aspect of this game. If you insist, feel free to use this as a ringtone or an alarm tone. With all four major aspects of the game being awful, there is not a lot left to say. When this game was released in 1988 by Infogrames, it was listed with a RRP according to ZZAP64 (who gave this game an overall rating of 8%) of 9.95 for tape and 14.95 for disk. Even the best rated version, the Atari ST version, only scored a total of 34% — so I really pity anyone who gave their hard earned for this garbage. If you feel it’s worthwhile, please leave any comments you have about this. Thanks very much for reading.